A bevy of blues and other goodies off the old 78s and such. 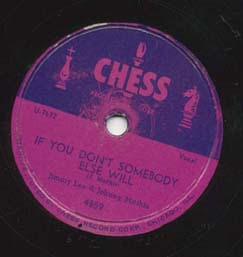 The show launches with a mystery track, though, followed by "If You Don't Somebody Else Will" by Jimmy Lee and the "other" Johnny Mathis. Then there's the legendary Kelly Harrell recording of "I Wish I Was A Single Girl Again," recorded a half-century before Prince, retrieved from the Internet Archive. It's mostly blues the rest of the way: Josh White and the "Stormy Weather Blues," Furry Lewis and "Mean Old Bedbug Blues," the "Phonograph Blues" from Robert Johnson, and finally "Whoa Back Buck" by Leadbelly with the Golden Gate Quartet. Which reminds me: This episode contains a small dose of "adult language." The show closes with "The Vamp" from 1919, performed by the Joseph C. Smith Orchestra with Harry MacDonough and Billy Murray. Click the podcast icon or download direct here.